Topical application of caffeine augments the number of apoptotic keratinocytes (sunburn cells) following UV irradiation. We examined the role of caffeine in protection from UVB-induced chronic photodamage and in apoptosis of keratinocytes shortly after UVB exposure in SKH-1 hairless mice. Topical application of caffeine decreases UV-induced skin damage as assessed visually by skin roughness and transverse rhytides (wrinkles). Caffeine has no effect on UV-induced epidermal hyperplasia, solar elastosis, and angiogenesis. 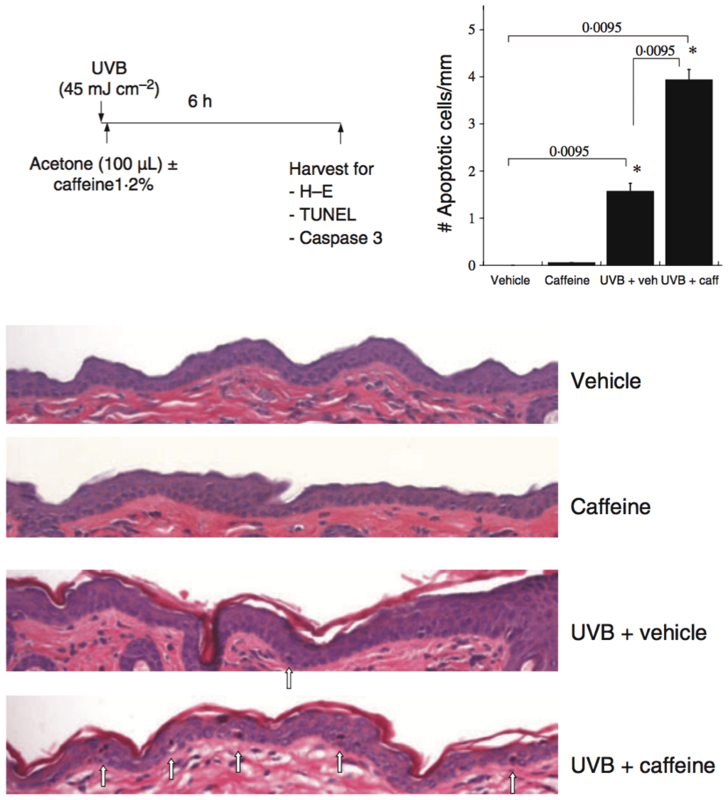 Caffeine augments UV-induced apoptosis in the basal layer of the epidermis as measured by sunburn cells and TUNEL. BACKGROUND: Characterization of mechanisms that can reverse residual damage from prior skin exposure to ultraviolet (UV) would be of considerable biological and therapeutic interest. Topical caffeine application to mouse skin that had previously been treated with UV has been shown to inhibit the subsequent development of squamous cell carcinomas. OBJECTIVES: We used an established mouse photodamage model to investigate other possible effects of topical caffeine application after UV. METHODS: SKH-1 hairless mice were treated with ultraviolet B (UVB) followed immediately by topical application of caffeine or vehicle three times weekly for 11 weeks. RESULTS: Caffeine applied topically after UV treatment resulted in a significant decrease in UV-induced skin roughness/transverse rhytides as assessed by treatment-blinded examiners. Histologically, topical caffeine application after a single dose of UVB more than doubled the number of apoptotic keratinocytes as evaluated by sunburn cell formation, caspase 3 cleavage and terminal deoxynucleotidyl transferase-mediated dUTP-biotin nick-end labelling (TUNEL) staining. A trend towards decreased solar elastosis was noted in the caffeine-treated group although this was not statistically significant. Other histological parameters including epidermal hyperplasia, solar elastosis and angiogenesis were increased in mice treated with UV but topical application of caffeine did not alter these particular UV effects. CONCLUSIONS: These findings support the concept that topical application of caffeine to mouse skin after UV irradiation promotes the deletion of DNA-damaged keratinocytes and may partially diminish photodamage as well as photocarcinogenesis.